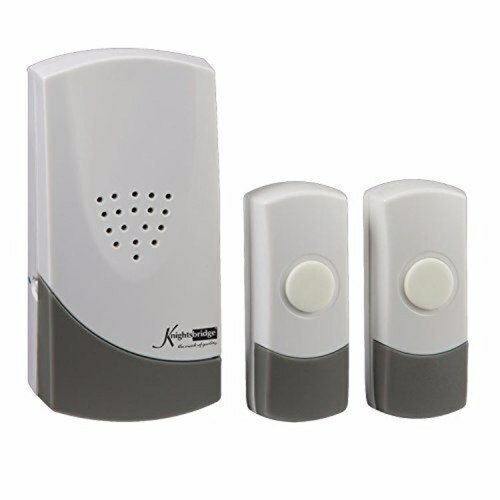 Knightsbridge’s Wireless Dual Entrance Door Chime Kit (DC007) is ideal for homes and small businesses with two separate points of entry. It includes one plug-in receiver and two IP44 rated doorbells, each with its own distinct ring to avoid confusion. The DC007 also boasts a 100m range. 2 Chimes/Melodies (1 per bell push). 100m Transmission range (dependent on environment). 433MHz +/- 0.5MHz Transmission Frequency. Comes complete with 1 years warranty from the manufacture. The door chime arrived within schedule , it's ideal for our purposes with the 2 bell pushes giving different chimes for front and rear use , however dont be misled , there are only 2 chimes with the only option being which 1 for front , therefore the other chime is the rear , there's no menu/variety to choose from , but still a good product . I can only get one of the buttons to work at a time, any suggestions?